Frances McDormand plays the flinty title character in the two-part miniseries, which runs Sunday and Monday nights on HBO. 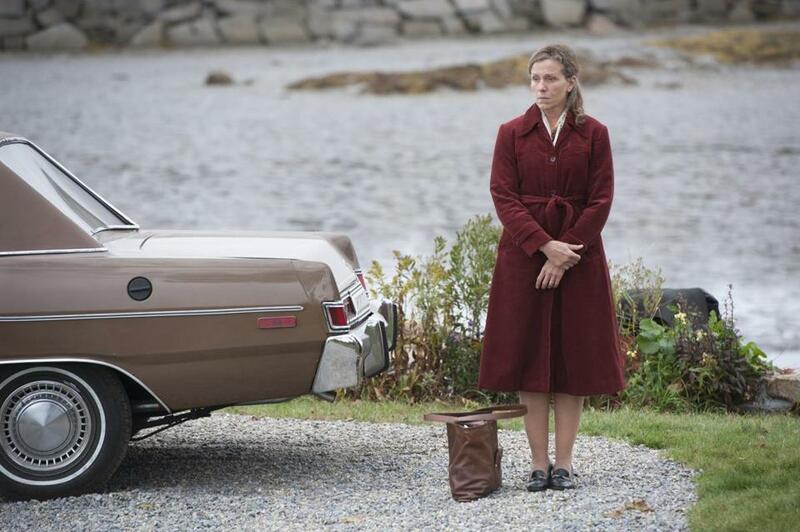 The story of Olive Kitteridge is an unlikely candidate for a TV miniseries. And that’s what makes it such a magnificent TV miniseries. Olive is hard-bitten, stoic, a cold, craggy rock in the Maine coastal landscape where she has always lived. Nothing much happens to her, her husband, and their son across their lives together, just the slow erosion of bonds and the tenacity of a deeply buried dream of romance. And yet, like the extraordinary Elizabeth Strout novel-in-stories that it’s based on, HBO’s “Olive Kitteridge” accumulates with steady, earned drama into a searing portrait of quiet desperation. It’s sad, unsentimental, and lovely. The two-part miniseries, which runs on Sunday and Monday at 9 p.m., manages to capture the soul of New England through the soul of a woman, so salty, so stubborn, so enduring, so loyal. It gives us our own kind of “The Last Picture Show,” revealing a cultural pocket — the community of the fictional Crosby, Maine — where Main Street looks quaint, but where desolation holds on underneath like a barnacle. The 1950s seem never to have ended in Crosby, even as the town pharmacy gives way to a chain store and white frosts Olive’s hair like wisps of snow. Odds are that whoever would get such an unlikely story onto TV would probably do it as a labor of love, with a strong vision. And such appears to be the case with the HBO adaptation, which is directed by Lisa Cholodenko of “The Kids Are All Right” and written by Jane Anderson, who is responsible for two memorable TV movies, “Normal” and “The Baby Dance.” The pair have found a natural way to make Strout’s fragmented approach, with its leaps in time, work smoothly on the screen, adding a tad of chronology, dropping a few side stories, and making Olive a more obvious uniting factor among all the characters. By the end of the four hours, each of which is titled after a chapter in the book, the miniseries has done nothing less than define a life. You’ll feel as if you know this woman inside and out. And, most important, this woman is played by Frances McDormand, who becomes Olive, the ornery seventh-grade math teacher. When reading the 2008 book, which won the Pulitzer Prize, I’d pictured Kathy Bates or Margo Martindale as the lead, as she ages from 45 to 70. But now I can’t see anyone other than McDormand; she owns this role, which is almost the polar opposite of her Oscar-winning turn as the polite Marge Gundersen in “Fargo.” McDormand never asks us to like Olive, who insults children and heaps resentment onto her nurturing husband, Henry. She never tries to make Olive’s crabbiness into lovability. She brings us into a strong sense of intimacy with Olive, shows us all her layers, and yet she hasn’t once invited us in. A fan of “Olive Kitteridge,” Frances McDormand optioned the book the week before it was nominated for a Pulitzer Prize. Some of the most powerful moments in the miniseries are the glimpses of what lies beneath Olive’s flintiness, such as when she helps a suicidal former student, Kevin, and discloses that her own father killed himself when she was a kid. We instantly understand why Olive fights attachment to her husband, why she finds childhood such an intolerable phenomenon. But during those scenes, McDormand holds onto Olive’s derision and irony, making jokes about her proctologist daughter-in-law — “Can you imagine where her hands have been?” — while talking Kevin down. Olive’s relentless pessimism, her feeling of being underwhelmed by life, doesn’t stop her from saving a life. There are many deaths in “Olive Kitteridge” — I counted three in the first hour — but there are a few rescues too. 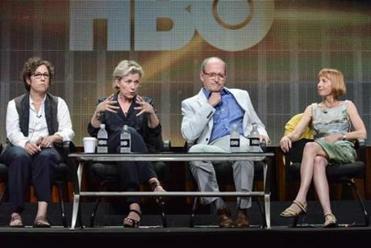 Each cast member assembled around McDormand is exceptional, most of all Richard Jenkins as Henry, the town pharmacist. Jenkins lets us see the childishness of Henry’s persistent cheer, but he dignifies it too. Henry isn’t a fool; Olive doesn’t suffer fools. He takes his wife’s abuse because he admires her willingness to let her feelings out, to speak her mind in ways that he can’t. Jenkins shines when Henry covertly smirks at his wife’s flinty quips, and he is touching when he develops a crush on his new assistant, Denise. Denise is as simple and naive as Olive is cynical, and Henry longs to protect her from the ravages of the world. When he invites Denise over for dinner, though, he can’t stop Olive from sneering at her mousiness. But then Denise doesn’t even realize it; she’s that wide-eyed, and that thick. I can’t say enough good things about Zoe Kazan as Denise. She makes this helpless young woman by turns into comic relief, a fountain of joy, and a figure of pathos, fragility, and tragedy. Peter Mullan is just right as Olive’s soul mate, a fellow teacher whose rumpled world-weariness she finds alluring. In the later part of the miniseries, John Gallagher Jr., who plays Jim on “The Newsroom,” adds complexity to the story as Olive and Henry’s adult son, Christopher. He makes Christopher’s bitterness toward his mother, and his avoidance of his passive father, understandable. Bill Murray, too, adds some life to the tail end in a small role. So to those who are anxious about whether “Olive Kitteridge” has survived its journey to the screen, I say relax. On HBO, the story of Olive and her miserable life is as small and ordinary as it is epic.